The United States, Great Britain and Soviet Russia all now possessed atomic weapons, all of them much deadlier than anything in history. But what their diplomats did not possess, L. Ron Hubbard reminded auditors, was knowledge of “the most tiny fundamentals of getting along with another individual or group. This they do not know.” In consequence, a potential cataclysm loomed. Even without war, nuclear testing spewed radiation, restimulating people onto their First Dynamics. The solution required a basic attitude to the world at large: Auditor to preclear. Hence, the renewed importance of Control, Communication and Havingness (CCH) in terms of planetary salvage. And what Mr. Hubbard delivered on the 17th American ACC was intensive instruction on the components of CCH—from Dummy Auditing to teach the Communication Formula, to what would become CCH 1, CCH 2, Tone 40 on an Object and Tone 40 on a Person. Here, indeed, is a comprehensive overview of virtually every single fundamental—the Parts of Man, ARC, the Tone Scale—specifically in terms of reversing societal decline. Then, crossing the Atlantic, L. Ron Hubbard released these breakthroughs to an even wider sphere at the London Congress on Nuclear Radiation, Control & Health. A Scientologist is one who controls people, environments and situations from Tone 40. Oh, you want a situation controlled? Call a Scientologist. The year 1957 had opened on a world dogged by uncertainty and anxiety about the future and as January moved into February it brought no easing of tensions. With the West and the Soviet empire continuing to face off in a Cold War with no apparent end, and the United States, Great Britain and Russia all possessing atomic weapons, the prospect of a real war “hotter” and more lethal than any in history presented a very tangible threat. Yet, given the urgency and the sheer magnitude of what had to be done, Mr. Hubbard drove forward with further administrative and technical developments and the creation of competent auditors. 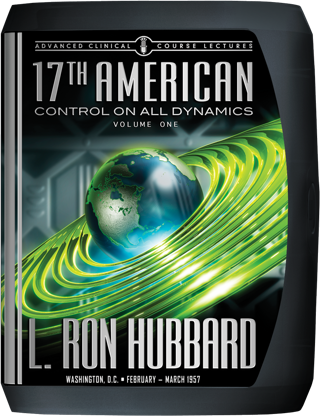 So it was that a mere thirteen days after he delivered the concluding lecture of the 16th ACC, L. Ron Hubbard began the opening lecture of the 17th American Advanced Clinical Course—on Monday, February 25, to be precise—at the Founding Church of Scientology at 1812 19th Street in Washington, DC. “You’re quite well aware of the fact that there might be just a tiny amount of radiation in the air, which would never really damage anybody physically at all, yet which would restimulate people into a heavy, unknowing games condition. So they would begin to act more and more hectic and on the First Dynamic. This would be one of the first symptoms that you would discover in a society, is everybody takes out on the ‘only one’ classification. Therefore in what followed, and indeed throughout the next five weeks, those students found themselves charged with a unique responsibility. For none but trained auditors possessed the technology and the capacity to reverse that dwindling spiral. And what that necessitated, Mr. Hubbard emphasized, was their basic attitude to the world at large: Auditor to preclear. Thus, when speaking of that attitude, the renewed importance of Control, Communication, Havingness (CCH), not solely as processes to raise the ability of a preclear in his own life, but in terms of expanding their application to control the environment and accomplish planetary salvage. It was a mandate carrying a stamp of unequivocal urgency. The Professional Scientologist—how to be a professional in any sphere of influence, all to the purpose of improving the individual and the civilization. 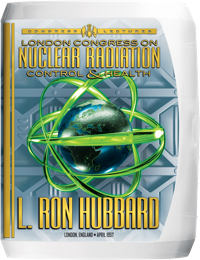 Moreover, close on the heels of this history-making ACC, L. Ron Hubbard crossed the ocean for the London Congress on Nuclear Radiation, Control & Health, where he released his breakthroughs on the broad application of CCH to an even wider sphere. And that, in turn, marked another watershed, for in response to a demand too insistent to ignore, the lectures from that Congress were transcribed and placed in the hands of Members of Parliament—with the text then forming the basis for Mr. Hubbard’s definitive book on the subject, All About Radiation. Published that May, it immediately sold out in bookstores, with the public grabbing every available copy. Thus, his discoveries about the restimulative effects of radiation and, most important, his technology for destimulating a civilization exposed to that menace, rapidly made their way into the hands of those who most needed the data—the general public.